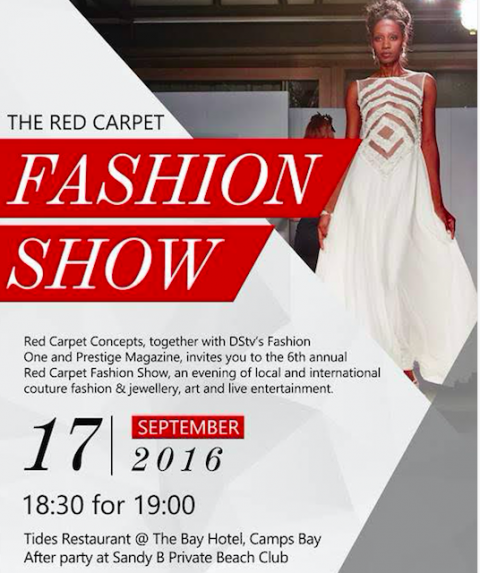 The 6th annual Red Carpet Fashion Show in collaboration with Prestige Magazine and DStv’s Fashion One is taking place this coming Saturday, 17 September at The Bay Hotel, Cape Town and promises to be a fashion event to remember. The evening is dedicated to showcasing local and international couture fashion and has brought on board the best partners and local talent for jaw dropping performances before, during and after the show. This year’s designers include Devernois (France), Hackett London, Juicy Couture (USA), Vilebrequin (St Tropez), Etnia Barcelona eyewear and TAG Heuer, SA’s King of Couture Jacques La Grange, rising and renowned fashion powerhouses Joanna Hedley, BeachCult, theHive, OnTrend, M Couture and Tread + Miller. Tickets for the show can be purchased through Quicket for R695 and VVIP tickets are R1000 offering exclusive seating at both Sandy B Private Beach Club and Tides. We hope to see you there fashionistas! No comments yet on The Red Carpet Fashion Show 2016 .